Comfort, style and large spaces in the principal areas of the main deck. A long corridor with doussie flooring leads through a large saloon with living area and TV zone and a dinette with a cherrywood and glass table seating eight: the elegance of the d�cor and the extraordinary amount of light are a continual surprise. The owner�s suite, midships, is outstanding in its breadth and the sumptuousness of its furnishings. Lit by the exclusive rectangular windows on either side, it offers a lounge area, vanity corner and wardrobes in linear grain cherrywood, and has two bathrooms, designed for him and her, with a hydro-massage tub and shower. Bed-head and frame lined with leather, ceiling and walls with prestige fabrics also in the spacious and luminous VIP cabin in the bows. The two elegant twin-berth guest cabins each have a private bath and shower. The Azimut 82 helm station: class and technology in partnership. The pilot seat, a passenger seat on either side, and avant-garde instrumentation give total control of the yacht in maximum comfort. 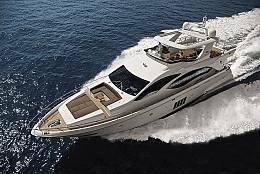 The Azimut 82 flybridge: boundless space for living under the sun. Two extraordinary sun-pads, fitted out for every possible need, and a splendid round hydro-massage tub accommodating five people under a hard top that opens electrically. Relaxation and comfort are guaranteed by the vast forward sun-lounge, which includes a cocktail area with coffee table and sofa. Indulging in 138.736 square yards of livable space from stern to bows, encircled by sinuously caressing lines, is a truly incomparable experience.